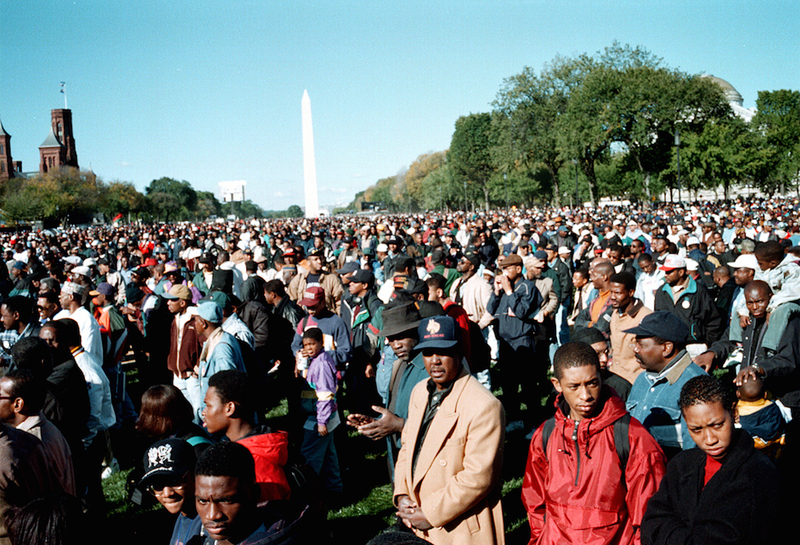 Earlier this month, thousands of people of African descent converged on Downtown D.C. to commemorate the 20th anniversary of the Million Man March. The event, themed “Justice or Else!” attracted black men, women, and children from across the country eager to take the fight against police brutality and systemic racism to the next level. The hype around the mass rally, however, didn’t prove enough to convince some young people to support the Honorable Minister Louis Farrakhan and Nation of Islam (NOI) on October 10. Those who stayed home did so out of disdain for the NOI’s views on women and homosexuality, and skepticism about the event’s effectiveness. The decision to sit out of “Justice or Else!” didn’t come quickly for Stewart, who initially planned to participate with her boyfriend as an act of black resistance. But as she learned more about Min. Farrakhan’s take on issues related to black women and gay rights, attending the march in solidarity with her brothers and sisters in the LGBTQ community seemed like a conflict of interest. “How could you claim that you support the black community when you ignore the disrespect of women and LGBTQ people in our community for the ‘sake of the movement’? There’s no room for hate.” Stewart, 22, said. Stewart’s sentiments echoed that of some Millennials who felt conflicted about “Justice or Else!” but attended anyway out of an obligation to support Min. Farrakhan and NOI. However, for some who made that choice, parts of his more than 3-hour speech didn’t sit well. While Aaron Goggans, campaign coordinator at the DC Employment Justice Center, said he enjoyed seeing the exchange of black dollars on the National Mall, he took to social media to criticize Min. Farrakhan’s call for women to “sacrifice themselves for their offspring because they’re genetically programmed to do so.“ He, too, noticed a seemingly blatant disregard for black women’s control over their bodies. Popular blogger TheNewAfrican also grappled with her decision to attend the march, saying it showed her that much work remains to be done to address the complexity of blackness she said elders often gloss over. In her Tumblr post, titled “Reflections on the Million Man March,” she too criticized Farrakhan’s diatribe against abortion and called on members of the black community to unlearn oppressive behavior that hinders the present-day movement. In the weeks leading up to the march, NOI, along with other organizations, rallied support among black women during panel discussions at Galbraith A.M.E. Zion Church in Northwest and Union Temple Baptist Church in Southeast. Even there, the organization’s conservative messages often clashed with those that resonate with young black women. Tia Dolet, president of the Black Graduate Student Association at University of Maryland, College Park, faced a similar dilemma when she attended campus forums about the state of the black male population. She said that when it came to matters of academic achievement, some panelists placed blame on the young women, telling them to help their brothers more. Fatigued of male-centered dialogue that didn’t acknowledge women’s significant role in today’s movement, Dolet decided to sit out of “Justice or Else!” She mulled over her choice with her fellow executive members, many of whom were either black women or members of the LBGTQ community. She later recounted reading criticisms of Min. Farrakhan’s speech on social media and hearing the stories of friends leaving in the droves. Like Stewart, Dolet remained resolute in articulating her point of view among those sympathetic to Min. Farrakhan’s cause. She said productive dialogue came out of that, with some young black men understanding the importance of intersectionality, defined as the crossing of different forms of oppression. Even with a post-march meeting, outline of demands, and a call to boycott corporations during the holiday season, some Millennials who didn’t attend the march see little value in asking the oppressor for justice. Bowie State University student Amadu Jalloh, suspicious of the NOI’s involvement in the assassination of famed member Malcolm X, said attending “Justice or Else!” would have went against everything the late activist represented. Against his friends’ wishes, he worked on the day of the march, criticizing NOI’s inclusion of other oppressed others he said have seen relatively more progress.